You would think from the persona that Ryan Rems Sarita often projects on the stage of the ABS-CBN noontime show ‘It’s Showtime’ that he is not capable of emotions as you and I are. But he is, particularly after running away with the title of the show’s first-ever Funny One and earning a check worth one million pesos for doing so. “This was all an accident,” he almost chokingly spoke to the audience after being asked to say a few words after his victory. “I applied (at ABS-CBN) to become a writer but was told that there was no vacancy for writers. One of the staff who interviewed him saw that he used to do stand-up comedy and asked him if he would be interested in auditioning for the new Showtime segment instead. The rest, as an old cliché goes, is by this time now history. I was, but of course, rooting for Ryan Rems in yesterday’s final of the Funny One segment. We all have to congratulate the production staff of ‘It’s Showtime’ for the wonderful entertainment that Funny One has brought all of us; and I, for one, had not had as good a laugh in recent months as I did yesterday. Based on how people have embraced Ryan Rems’ self-deprecating and sometimes even black comedy as evidenced by more activity on social media than any of the other finalists, it is easy to imagine that there were plenty who expected him to run away with the title. Personally, I believe that the contest was closer than most people would have been willing to believe. Ryan Rems’ material yesterday was good; but there were performances in the elimination round when it was better. In fact, I laughed harder at the antics of that idiotic trio from Davao called No Direction as well as the father and son tandem from Cebu called Crazy Duo. These two comedic acts are both shamelessly slapstick in their approach; and I outgrew this type of comedy years ago. However, both groups reserved their best materials for the last in stark contrast to Ryan Rems. Hence, I felt that the two acts were in the best position to give the latter a real run for his money; and for a while, I even thought that Crazy Duo would be crowned winner. Their routine was done confidently, timed perfectly and combined Three Stooges style physical comedy with well thought out jokes. The live studio audience could not stop laughing; and frankly, neither could I. That Gibis Alejandrino would finish last was a no-brainer; and his declaration while performing that he would not mind finishing last in the finals ultimately turned out to be a self-fulfilling prophecy. His performance bombed really badly, which I felt was a pity because with good material, he can be as good as all the other finalists. Wild card finalist Nonong Ballinan was my bet to finish fourth. His Pnoy spoof was starting to really sound worn-out; and yesterday’s material was not as good as when he won through from the wild card round. Thus, I was surprised and a bit disappointed that he finished even above No Direction at third. Of course, the Judges were probably always looking out for Ryan Rems, if you know what I mean. Funny One, after all, was always a talent discovery show; and in my opinion, nobody even gets close to ABS-CBN in spotting and nurturing potential. 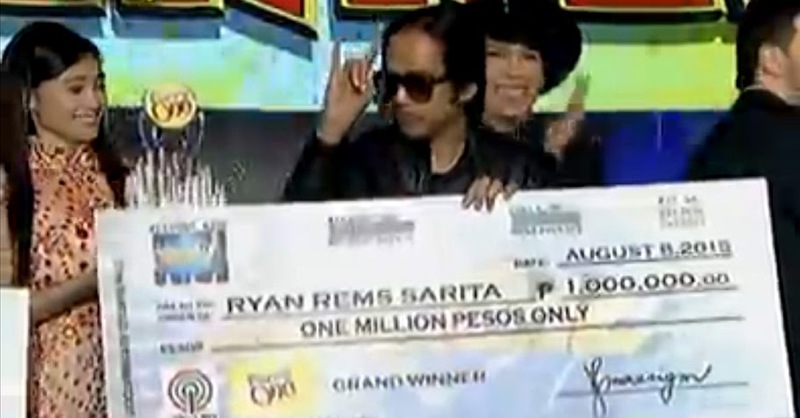 There is, perhaps, a bit of irony in Ryan Rems winning the contest and pocketing the one million prize. In one of the live teasers that Showtime put together earlier last week, Ryan Rems told the Showtime hosts that he would not mind finishing last in the finals since the runners-up of these television contests, or so he said, seemed to earn more gigs than those who do win. Cheeky, yes; but a lot more truth resonated from that statement than network execs will probably be willing to admit. One does not have look far and indeed, with PBB alone, the runners-up have done as well if not better than the actual winners. Ryan Rems is nothing if not resilient, though; and this was never more evident than in his performance in the finals yesterday. When one of his jokes bombed, he turned a sticky situation around by telling the audience after a moment’s pause that the joke would sound better after an hour. This is the same resilience that allowed him to bounce back after not once but twice losing the weekly face-off contests in the elimination round. Both times, he came back to the Saturday Funny One More Chance with better material and delivery to earn the nod of the judges by the proverbial mile. Whether Ryan Rems has the ability to stay, this we will all see. His brand of humour is something of an acquired taste; albeit that he draws material from all sorts of mundane situations that you and I can all relate to means that his appeal has the potential to be massive.